Hope that you have all had a nice weekend – we had one of the very variable Yorkshire ones – very hot on Sat so after domestic chores I did some gardening then we had a lovely BBQ with Ellie’s friends Danni and Becky who had arrived for the weekend before leaving for Spain this morning. Sunday it poured it down all day – the girls went to Leeds Armouries for the day where it was luckily drier. I sat at the sewing machine all day watching the rain and have nearly finished a new medieval dress for Ellie (pics after once I have done the fastening holes). It took quite a long time as it is a new design for me – the main body of the dress is a very dusky pink with pale pink gored inserts all the way round from the waist line which give it a lovely flared look. No time to fettle V and A pics yet so will share a couple of ones of our show last weekend with you – these first two come from Clare Grey who put them on Facebook – I was tagged via a friend in the group so I hope that she won’t mind me sharing them with you. It is rare to get a pic of me in the show which is understandable as I am in the background most of the time behind the glamorous boys in their pretty costumes! The first pic is when all the knights first come out onto the arena – don’t they look wonderful with their surcoats and mantles on their helms.The mantles – cloths and wooden carvings that go on top of the helms – are new this year and I will try and get some close up pics at some point as they are fab – not allowed a camera when in kit so bit difficult! 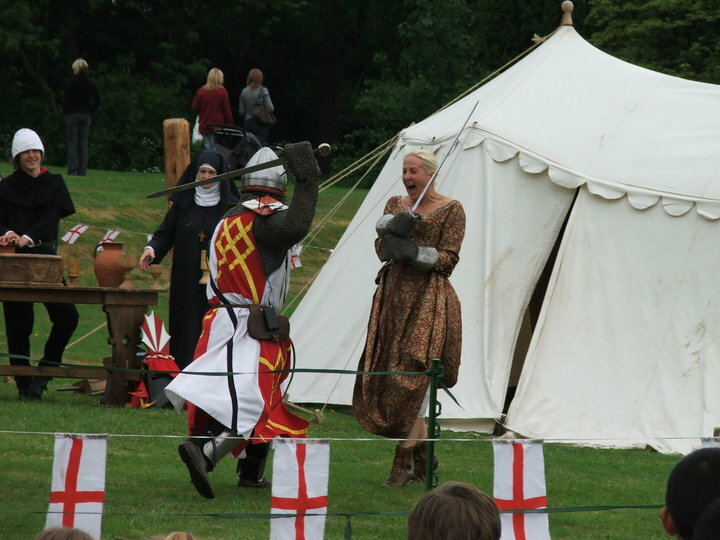 The second pic is take at the end of the show when Lord and Lady Despenser fight for the tournament money (she wins you will be glad to know!) I am standing at the table behind them with my water jugs and Jake is next to me – we make sure that all the guys have enough water during the tournament and Jake also helps with the weapons and amour as needed. The Despencer's way of solving marital disputes! 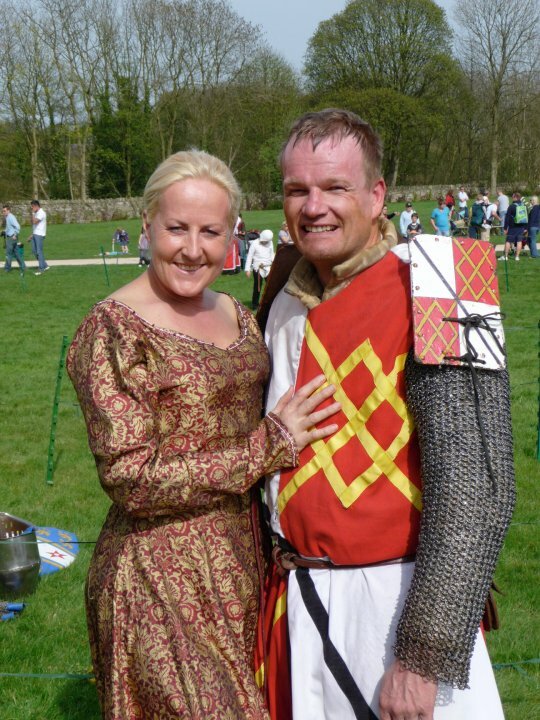 We all spend a lot of time making, mending and adding to costume and kit as well as a considerable amount of money in some cases. The dress that Lady Despencer is wearing here is made of pure silk , all hand stitched with real seed pearls and amethysts – the fabric alone cost £25 a metre and there is a lot of fabric in it! We all have started off with a basic set and added to it over time. 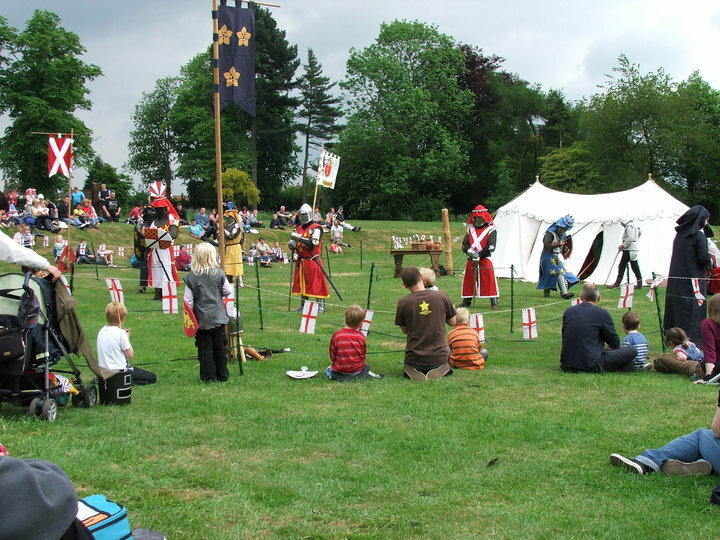 The armour and weapons are also expensive – a helm and sword costs about £400 so making our own costume is one way to keep down the expense. The guys are very inventive and skilled as well – often buying parts and putting things together themselves to save money. 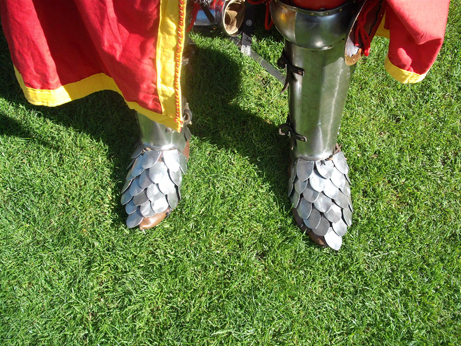 The pic below shows Luke (aka William de la Zouche whose castle we were at last weekend) with his new scale mail sabatons ( armoured shoes). He bought the scales from Ebay (don’t you just love the internet!) and put them together himself. So I have the dress to finish for Ellie , an old dress of hers to alter for me, a cloak to mend and another two sets of brais to finish before our next event in 10 day’s time! Lots of sewing ahead! Hope that you have a very nice week – thanks for visiting! A grand day out and a slightly damp BBQ!